Edinburgh Castle St Margarets Chapel Wedding. Edinburgh castle is one of the most interesting, most historical, most beautiful (in a Scottish castle kind of way) and most difficult and easy places to visit. I’ve only ever walked around Edinburgh Castle once as a paying visitor with my daughter and it was pretty cool to check our the different halls and exhibitions. I wrote an article and took some photos here which you’re welcome to read through. Professionally I’ve been to the castle a few times. The first time was when I photographed a wedding for Suzy and Kevin in 2013 and the second was in 2014 when I photographed a wedding for a couple who came over from the USA and got married in St Margaret’s Chapel. I then photographed another wedding for a couple who’s wedding I really loved the photos for but asked me not to share the photos (I can show you privately if you ask) and I photographed another wedding in the gatehouse above the main entrance which for some reason I never got round to sharing (maybe share soon). So I was pretty delighted when Lisa and James asked me to photograph their wedding at Edinburgh Castle this August. Edinburgh Castle is the easiest of location’s to reach in Edinburgh, it’s dead centre in Edinburgh and right at the top of the royal mile which infinite ways of reaching. The difficulty with Edinburgh Castle is the sheer number of tourists that visit. The castle as I wrote on the page I dedicated at the beginning of this article is the most visited tourist site in Scotland and one of the most visited in the UK. Literally millions of people visit it every year and I was talking to the staff at Lisa and Jame’s wedding and they said every year the castle gets so many percentage busier than previous years and this year they’re so busy they’ve stopped taking wedding bookings. For Lisa and James’ wedding I was only booked for a couple hours so I arrived at the castle my usual 30 minutes late, fought my way through the huge crowds of tourists and made my way to St Margaret’s Chapel at the top. The first photo in this article is a picture of just a tiny part of the crowd that was waiting outside the chapel. Lisa and James hired a proper military bagpipe player and you’d think the tourists had never seen a piper before! In previous weddings at the chapel tourists have tried to walk in and you can hear both the tourists and the staff inside the chapel during the ceremony really loudly. As you can imagine with the age of the chapel there are no mod-cons like sound proofing. You hear everything. The minister for the wedding was great, really funny and the ceremony itself took around 20 minutes. After the ceremony we took a few group photos (with hundreds of tourists behind me also taking photos) on the lawn in front of the war museum and then we headed into the banqueting hall for a short drinks reception. Following photos we did a really short tour of some pretty locations around Edinburgh. We decided to stay out of central Old Town, again because it’s so busy, so we headed to the Writer’s Museum, the Assembly Hall on the mound, went to Ramsay Gardens then down to Princes Street Gardens where we took photos in front of the groundskeeper’s cottage and some photos in a couple other spots. All in all I spent just over 2 hours with Lisa and James. Their wedding was the perfect length for myself (at least on that day) we took around 500 photos and had some fun. We had pretty great weather on the day, especially by the time we reached Princes Street Gardens and that’s another Edinburgh Castle St Margarets Chapel Wedding. The castle was awesome, the staff were great, the tourists were mental, Lisa and James were great to work with and it was a really short but really fabulous wedding. 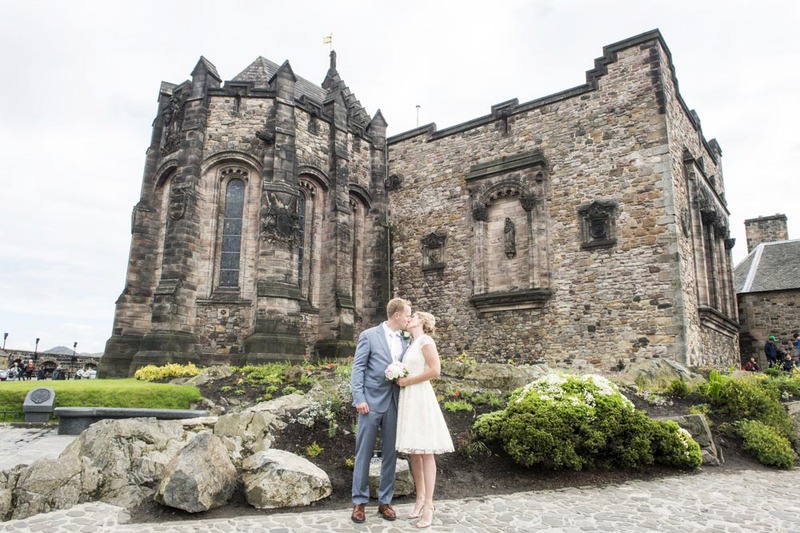 Hope you like the photos from this Edinburgh Castle St Margarets Chapel Wedding.